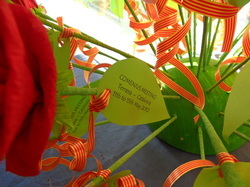 Terrassa - CATALONIA, SPAIN - Welcome to our Comenius Project Website! Oh, we can still feel the atmosphere of that meeting and let it last forever! We've visited Barcelona with its most beautiful and legendary places like Sagrada Familia by Antonio Gaudi, Camp Nou with Barca's stadium, had a stroll on La Rambla, and ate some delicious tapas and paella. The city of Terrassa welcomed us with a really stunning beauty of Fira Modernista - an annual festival devoted to modernism and everlasting beauty of a group of churches dating the 6th century called "Seu d'Egara". But that's not all. One of the most extraordinary things in Terrassa was Escola El Cim with its teachers and students to whom we would like to give our thanks. You were incredible. During our stay at Escola El Cim we presented our products which were playlets about our national stereotypes. The teachers also worked on the final report on the project. It's difficult to believe this was the last meeting in our project. We all hope to meet someday in the future and continue the process of breaking the walls dividing us.